Here are all the Athens sightseeing that we suggest. Have a look on various attractions that you can see during your visit in Athens, such as churches, monasteries, museums, castles and other sights. Situated on the hills 6 km from the port village of Oropos in northeastern Attica, the archaeological site of Amphiareion is one of the least known places of Athens. It dates from the late 5th century BC and it was dedicated to the hero Amphiaraos, where pilgrims went to ask for oracular responses and healings. Despite its central location, this site is one of the greenest places in Athens. Kerameikos was the cemetery of Ancient Athens from the 12th century BC to the Roman Times, around the 1st century BC. The museum of Kerameikos houses marble columns, sculptures, vases, and many figurines. The Archaeological Museum of Brauron is located in the south-eastern region of Attica at the Markopoulo area and was built in the late 1960s in order to host a variety of findings that derived from the excavations. The archaeological museum is located right next to the ancient site of Keramikos, the cemetery of ancient Athens. It houses findings from the site, such as funeral columns, vases, and statues. The Archaeological Museum of Marathon was built in 1975 and is a small but rather interesting museum that completes the archaeological site of Marathon. It is located nearby the memorial tomb of the battle of Marathon. The Archaeological Museum of Piraeus is located between Zea and Pasalimani, two lovely quarters of Piraeus. It mostly exhibits findings from excavations that date from the Mycenaean till the Roman times. The Art Collection of the National Bank of Greece was formed in 1841, right after the establishment of the bank itself. The collection includes 1,300 original works of leading 19th and 20th-century artists. It is located on Eolou st, between Omonoia and Panepistimiou metro station. The Attica Park is the only zoo in Greece and it is privately-owned. It hosts a vast bird collection, which is the third largest collection in the world and it has a large number of wild animals. All animals were born in the capture or they were used for laboratory experiments until they were housed in this zoo. It is located about 40 km from Athens, near Spata. Averof is actually a warship that has played a great role in Greek history. Today it has been restored and turned into a naval war museum. It is located in Trocadero Marina, Paleo Faliro. This museum houses the private collection of Antonis Benakis, composed by Bronze Age findings, works of El Greco, ecclesiastical furniture and many other collections. 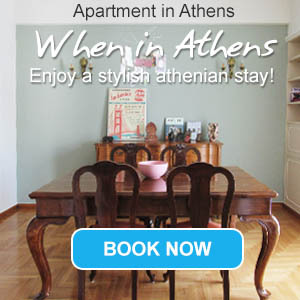 It is housed in a wonderful neoclassical house close to Syntagma square. The Diomidis Botanical Garden is a large space of 1,860 sq.m. with over 2,500 plant species from all over the world. A great place to walk and also study rare species of the ecosystem. This museum was founded in 1914 and it houses an important collection of Greek ecclesiastical art dating from the 4th to the 19th century: Byzantine and post-Byzantine icons, sculpture, manuscripts, wall paintings, mosaics, wood carvings and many objects (cloth, coins, pottery). The Museum is located close to Syntagma Sq. The Museum of Paul and Alexandra Canellopoulos is housed in a Neoclassical built in Plaka. It houses the private collection of the Canellopoulos, with more than 6,000 items and art pieces from the prehistoric until modern times. The Cartoon Museum operates since 1994 and houses the works of famous Greek cartoonists. There is a large collection of political cartoons, advertising material, and newspaper comics. The museum also includes an archive and a library. It is found in a walking distance from the metro station of Metaxourgio, on Liossion st.
At the corner of Panepistimiou Ave and Omirou st, there is the Catholic Cathedral of Saint Dionysius the Areopagite. Marble steps lead to the impressive interior of this church, whose construction was completed in 1865. Every Sunday morning at 11 am, people gather in Syntagma Square to watch the official changing of the guards, the military unit whose members stand proudly in perfect stillness in front of the Hellenic Parliament. There is, of course, changing every hour in the day, but on Sundays, it is the official ceremony with the official costumes. The Children Museum is found in Plaka, the oldest neighborhood of Athens, and its aim is to offer an enjoyable and educational experience to our children. Parents and grandparents can accompany the children. There the children will have the opportunity to play and learn together. At the corner of Eolou and Athinas street in Monastiraki, there is the impressive church of Agia Irini. It was constructed in 1846 by the famous architect Lyssandros Kaftatzoglou. The impressive church of Agia Marina is located right next to the National Observatory and beneath Pnyka Hill. It was founded in 1922 on the site of an earlier Christian temple and celebrates on July 17th. The Church of Agios Dimitrios Loumbardiaris is located on Philopappos Hill, on the way to Pnyka and the Monument of Philopappou. It is a tiny church whose name means Saint Demetrius the Bombardier. The Church of Agios Konstantinos & Eleni is located at the area of Omonoia, close to Metaxourgio neighborhood. The imposing temple designed by Kaftatzoglou is regarded as one of the most impressive ecclesiastical edifices of Athens. This church stands on Mitropoleos square, in Plaka neighborhood, on the side of the current Metropolis Cathedral. It is one of the finest Byzantine relics of the city and dates from the 12th century. This is another example of a church built on the ruins of an ancient temple. The church of Panagia Kapnikarea is one of the oldest temples in Athens and admittedly one of the most significant Byzantine edifices. The Church of Saint Dionysius The Areopagite is found on the prestigious downtown Skoufa street at the area of Kolonaki. It is dedicated to the protector Saint of Athens, Saint Dionysius the Areopagite. The impressive church of Agios Panteleimon was founded in 1910 by King George I. It was inaugurated in 1930 and has one of the largest domes in the Balkans. The church is located north of Victoria Square, along Acharnon street. This little jewel was built in the 10th century on the western entrance of Ancient Agora. It got restored to its original form in 1954-57, while its 19th-century additions were removed. Fine Byzantine frescoes can be admired inside this wonderful little church. This museum is a private collection of Cycladic art and Ancient Greek art of great importance, housed in a beautiful house. The Cycladic collection is a marvel of over 350 objects of the central Aegean Area, like marble sculpture and figurines or pottery, all dated between 3200 and 2000 B.C. The Ancient Greek Art Collection includes artifacts from the Bronze Age to the Roman times: pottery, terracotta figurines, sculpture, metal and glassware and jewelry. The Pierides Museum of Ancient Cypriot Art is dedicated to the presentation of the Cypriot culture and its connection to Greece. It is housed in the Cultural Venue Athinais, between Votanikos and Keramikos. This is a unique interactive museum that uses various exhibits, toys and fairy tales in order to help children understand the world of emotions. It frequently organizes seminars, workshops and drama performances. It is found in a walking distance from the metro stations of Acropolis and Syggrou-Fix. The museum is displaying an interesting collection of inscriptions from the region of Attica and from other parts of Greece. It is housed in the National Archaeological Museum of Athens. The Frissiras Museum is the only museum of modern European art in Greece. It was inaugurated in June 2000 and it is housed in two Neoclassical buildings in Plaka. The first building houses a permanent collection with 3,000 pieces of art and the second building hosts periodical exhibitions. Giorgos Gounaropoulos (G.Gounaro) was a renowned Greek artist who lived from 1890 to 1977. With international exhibitions and a personal technique, he was among the few artists who formed modern Greek art. His atelier in the area of Ano Ilissia has turned into a museum that hosts a large part of his work. The Hellenic Parliament is housed in an austere Neoclassical building on the top of Syntagma Square. It was originally constructed in the 1830s as the Palace of King Otto, the first king of Greece, but a century later it was dedicated to house the Greek Parliament. The Hellenic Motor Museum hosts the personal collection of Theodoros Haragionis. It is housed in the three last floors of Athenian Capitol in Patission Ave, very close to the National Archaeological Museum. The museum hosts 110 cars permanently, while the rest 190 of the collection are exhibited from time to time. The Herakleidon Museum of Visual Arts is a private space that opened in summer 2004. Housed in a Neoclassical building in the heart of Thission, under the Acropolis, the museum hosts exhibitions of artists who have played an important role in the evolution of art. It also frequently organizes seminars and workshops. The Jewish Museum of Greece is located near Syntagma square. It was founded in 1979 and it is dedicated to the life of the vast Jewish community that flourished in Greece along centuries. Karagiozis, the most characteristic figure of the Greek shadow theatre, has a unique museum created by the shadow-player Eugene Spatharis. The museum is housed in a Neoclassical building in Marousi, northern Athens. Lake Marathon is a water supply reservoir that was constructed in 1931. Although it is an artificial lake, it matches perfectly the landscape of the region and provides a nice place to relax close to Athens. This private museum is a center for international jewelry studies. It exhibits the beautiful creations of Ilias Lalaounis, a famous Athenian jeweler and goldsmith, elected member to the French Academy des Beaux-Arts. The Library of Hadrian is located in the north of the Roman Agora, right outside the metro station of Monastiraki. It was constructed around 132 AD by the Roman Emperor Hadrian. Seen from every spot of Athens center, the hill of Lycabettus can be reached on foot or by funicular train from Kolonaki. A white church stands on top of the hill, which gives a nice view to the busy town. The Marathon Run Museum is located in the town of Marathon, northeastern Attica. This museum is dedicated to the modern history of the Marathon Race and includes rare exhibits and metals of Greek Marathon runners. Established in 1986, this museum hosts various minerals from the region of Lavrion, on the southern side of Attica and close to Sounion. The subsoil of the area was largely exploited for its minerals in the ancient times and its exploitation started again in the 19th century. The Monastery of Daphni was built in the 6th century BC. One of the oldest monasteries in Attica, it has been damaged and rebuilt many times along centuries. It distinguishes for the wonderful frescoes. This church was built in the 11th century in the Greek-cross plan and dedicated to the Presentation of the Virgin. It was originally a temple to the glory of Demeter, the goddess of agriculture and nature. A lovely green forest surrounds the monastery and many trekking paths cross it. This monument is located a few steps from the Acropolis Museum and was constructed to commemorate the award of the choregos Lysicrates in some festival performances in the 4th century BC. Since October 2010, the Municipal Gallery of Athens is housed in a Neoclassical building in Avdi Square, Metaxourgio. It owns about 3,000 pieces, most of them painted by the 19th and 20th century, Greek artists. Established in 1957, the Municipal Gallery of Piraeus has changed many buildings since then. Τoday it is housed in the building of the old post office of Piraeus. It owns a large collection of artists, among whom Lytras, Axelos, Volanakis, and Christofis. Inaugurated in 1988, the museum is dedicated to the study of the Greek traditional costume. It is located in Kolonaki, between the metro stations of Panepistimiou and Syntagma. The Museum of Alex Mylona opened in March 2004 and in 2007 it was donated to the Macedonian Museum of Contemporary Art, which is based in Thessaloniki. It exhibits works from the 50-year career of the sculptor Alex Mylona, including her beautiful works on marble, copper, iron, and bronze. This museum is dedicated to the Greek folklore music and it has an amazing collection of about 1,200 Greek popular musical instruments dating from the 18th century up to the present day. The museum exhibits traditional Greek instruments like toumberlekia (pottery drums), daoulia (drums), defia (tambourines), laghouta (long-necked lutes), outia (short-necked lutes) and many more. Established in 1994, the Museum of Greek Children's Art aims to promote art expression in young age. For this reason, it regularly organizes seminars and workshops for children, teachers, and parents. Its exhibitions change frequently and include mostly works of children. This interesting museum houses rich collections of objects representing all branches of folk art from 1650 till today. Exhibits include embroidery, weaving, costumes and more. The Museum of Islamic Art is a department of the Benaki Museum and opened in July 2004. It is housed in a Neoclassical building and hosts about 10,000 items that date from the 7th till the 19th century. The Museum of Telecommunications, unique of its kind in Greece, opened its doors in 1990. It hosts an impressive collection of telecommunications material from the antiquity till today. The Museum of the City of Athens houses the personal collection of the art collector Lambros Eutaxias. It includes sculptors, paintings, drawings, photographs of Athens and even furniture of the 19th-century Athenian aristocracy. The Museum of Traditional Pottery is housed in a Neoclassical building of 1875, next to the archaeological site of Kerameikos. The ceramics that are exhibited date from the prehistoric times till today. The National Gallery of Athens is located right next to the Hilton Hotel, in a walking distance from Syntagma. It hosts permanent and periodical exhibitions. The National Observatory of Athens was founded in 1842 with the contribution of the national benefactor Georgios Sinas. Its architecture was designed by the famous Danish architect Theophil Hansen. The Nautical Museum is located in Marina Zeas, Piraeus. It hosts interesting pieces that depict the rich nautical history of Greece. Outside the museum, there is a copy of the historical submarine Papanikolis. This amazing museum houses some 60,000 coins, from the ancient Greek world until modern times as well as weights, lead stamps, medals, and precious stones. There are also ten thousand volumes devoted to the special field of numismatics, to its history, the seals and to archaeology. It is one of the best planetariums in the world and was established with the testament of Eugene Eugenides, a Greek shipowner, and benefactor, who wanted to create an institution that would educate Greek young people in the sections of technology and science. The Athens Digital Planetarium counts on a large scale cinema projection system, which displays images over an area that is ten times bigger than a regular cinema room. Pnyx Hill is located right beneath the Acropolis, close to the quarter of Thissio. This is where the Athenians would gather to talk about political issues. This archaeological museum is located in Ancient Agora, inside the famous Stoa of Attalos. The collection of the museum is very interesting and diverse. It includes findings from the wells, deposits, burials, workshops, and sanctuaries of the area. This is one of the 5 tactual museums in the world, specially made for blind people. People can actually touch the exhibits, which are copies of famous works of art. The Temple of Artemis in Vravrona, also known as Brauronian Artemis, was a very important sanctuary in ancient times. In fact, every four years, there was a festival with a procession that started from central Athens till that temple. The Temple of Hephaestus is the best preserved ancient temple in Greece. It was dedicated to Hephaestus and Athena. The temple is located in Thissio, within a short distance from the Acropolis and Monastiraki, just above the Ancient Agora and the Stoa of Attalos. This theatre is the most important and oldest theatre in Athens. It is located on the southeastern slopes of the Acropolis. This is the site where the Festival of Great Dionysia used to take place. This festival was of great cultural importance and welcomed great play writers, such as Sophocles or Euripides. The theatre was later renovated with marble and had a capacity of 17.000 seats. Very little of the theatre survives today. The National Greek Dances Theatre of Dora Stratou is situated on the slopes of Philopappou Hill, just opposite the Acropolis Hill and a walking distance from the picturesque quarter of Thissio. Founded in 1953, it is actually a living museum since, every summer, five days a week, there are live performances of Greek traditional dances. The Tower of Wind stands in the quarter of Plaka, outside the Roman Agora. It was constructed in the 1st century BC by the astronomer Andronicus. Outside of the tower, there was a solar clock and in the interior, there was a hydraulic clock. The Tymbos of Marathon is actually a vaulted tomb where the Greek soldiers who died in the Marathon Battle against the Persians were buried. Right next to this tomb, there is a statue of Miltiades, the Athenian leader. Vorres Museum is located in Peania, on the northeastern side of Athens, and has two sections: a section of Contemporary Greek Art and a section of Folk Art. Its large collection presents 2,000 years of Greek history. The museum consists of two buildings and gardens that cover 12,000 sq.m. The War Museum of Athens was founded in 1975 and it is dedicated to the army and the Naval Forces of Greece. It is located between the metro stations of Syntagma and Evangelismos. The Wine Museum in Pallini, northeastern Athens, opened in 2005 and it was created by a family that occupies with wine for 4 generations. The museum is located under an old vineyard and exhibits old tools and a rich collection of photos. Zappeion Megaron is an impressive Neoclassical building right next to the National Garden, Syntagma. It frequently hosts meetings and exhibitions today. The New Acropolis Museum was inaugurated in June 2009 and it is housed in a modern building right opposite the site of the Acropolis. The items displayed in the New Acropolis Museum were all found on excavations on the Acropolis. The most famous display is the frieze of Parthenon Temple. The unfortunate thing is that pieces of this frieze are missing, as they are housed in the British Museum in London. The Acropolis is also known as the Sacred Rock. Famous all over the world as the symbol of Greece and the Greek culture, the Acropolis stands on the highest spot of the city. Just opposite the site, there is the new Acropolis Museum. The Theatre of Herodes Atticus, or else Herodeion, is one of the most impressive monuments of Athens. Located on the southern slopes of the Acropolis, the theatre was built in 161 BC by Herodes Atticus, a wealthy Roman general in memory of his wife, Regilla. It has exceptional acoustic capacities and can sit up to 5,000 spectators. Performances of the Athens-Epidaurus Festival are held there in summer. The temple of Olympian Zeus took 700 years to be built. The work was completed by Emperor Hadrian in 131 AD. The huge Temple was composed of 104 columns of Corinthian style, 17 m high each. Today only 17 columns have survived. This impressive arch was built by Emperor Hadrian in 132 AD to mark the limit between Ancient Athens and his new city. It is located at the end of Amalias Avenue, right next to the temple of Olympian Zeus. The Roman Stadium stands next to the National Garden and Zappeion Megaron. It was originally constructed in the Roman times and it is entirely made of marble. Excavated in 1870, this stadium was renovated to host the first modern Olympic Games in 1896. It is also known as Panathenaic or Kallimarmaro Stadium. The Temple of Poseidon in Cape Sounion, the southernmost spot of Attica, was built in the 5th century B.C. and a part of it survives till today. This is one of the most famous ancient sites in Athens and gives an amazing view of the sea and the sunset. The Ancient Agora was the social and political center of ancient Athens. This is where the people of Athens used to meet to talk about social issues. The temple of Hephaestus is the most distinctive spot of Ancient Agora, which is located between Thissio and Monastiraki. Philopappos Hill is also called the Muses Hill. It is located between the Acropolis and Thissio and offers a great view of the town. The funeral monument of a Roman general is located there. The National Archaeological Museum of Athens is the largest and most important museum in Greece, and its exhibits are between the finest collections of prehistoric items, sculptures, pottery, and minor art, bronzes and Egyptian art, everything followed by detailed explanations in English. It is located near Omonoia square. The Roman Agora lays between Monastiraki and Plaka. In this area, the Romans used to trade their goods, so it was used as a marketplace. The National Museum of Contemporary Arts has opened its gates in the renovated Fix Building in Kallirrois Avenue and welcomes loyal enthusiasts and new visitors alike to dive into the seductive world of contemporary art. Located right next to the Parliament, Syntagma Square, the National Garden is a lush area with trees, fountains and a small zoo. Although it is right in the heart of the town, this garden offers a nice spot to relax, away from the noise. The Historical Museum is housed in a beautiful Neoclassical building that used to be the Parliament House till 1932. This is the oldest museum of its kind and houses collections that date from the 15th century until the Second World War. The museum is found along Stadiou Ave, 10 min walk from Syntagma.